The most current, comprehensive osteopathic text available, Foundations of Osteopathic Medicine, Fourth Edition defines osteopathic terminology and techniques and instills the confident understanding essential to clinical success. This proven resource is the standard text for teaching the osteopathic profession, providing broad, multidisciplinary coverage of osteopathic considerations in the basic sciences, behavioral sciences, family practice and primary care, and the clinical specialties. Endorsed by the American Osteopathic Association, this popular text makes the key tenets of osteopathic practice more accessible than ever and demonstrates a wide variety of osteopathic manipulative methods in vivid detail. 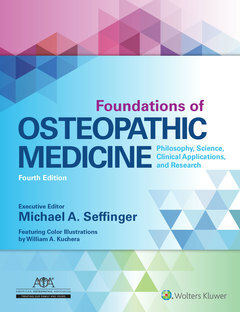 More than half of this new edition is made up of all-new content, reflecting current practices in basic sciences foundation, the osteopathic approach to patient care, somatic dysfunction and treatment, osteopathic considerations in the specialties, and research investigating osteopathic principles. New illustrations and a full-color design bring concepts to life, and enhanced pedagogical features make the entire text easier to use for students and practitioners alike. New and updated content instills a broad, multidisciplinary understanding of the latest osteopathic considerations in the basic sciences, behavioral sciences, family practice and primary care, and the clinical specialties. New and updated illustrations clarify concepts and procedures with step-by-step precision. Case studies help you apply your understanding to commonly encountered scenarios. New full-color design makes learning engaging and efficient. Bulleted lists detail key concepts at a glance. A complete glossary ensures fast access to essential terminology.